SWAMP SAFARI VILLAGE A TRUE FAMILY EXPERIENCE! 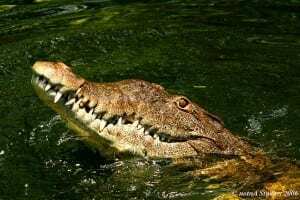 Located in a natural mangrove habitat in Falmouth, Swamp Safari Village is a place to find more than 30 of the endangered American Crocodile, the Yellow Snake, and the Jamaican Coney, which people had thought ceased to exist. Take a tour around this amazing little attractions to catch amazing views of wildlife and rare local birds. Venture into the Swamp Safari and meet hundreds of animal of the America’s including the Grey Fox, Raccoon, Capuchin Monkey, Green Iguanas, Collared Peccary and many more. 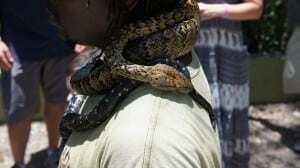 Visitors also stand a chance of seeing the 14 ft giant crocodile, known as Jeremiah; and an 18 ft Anaconda called Shakira. This Swamp Safari Village is a place where intruders are eaten, so it is best to visit on a guided tour in order to be kept safe. 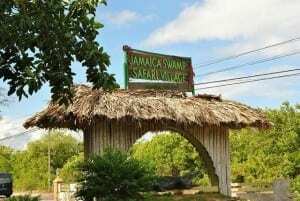 This lovely attraction is a place not to be missed by tourists vacationing in Jamaica, especially nature lovers and animal lovers as it offers you the chance to enjoy the great wonders of nature while exploring the village in the company of a professional, well experienced guide. Founded by Ross Kananga, who visited Jamaica with the intentions of building a crocodile farm, the Swam Safari Village started out as a place to three American Alligators, a pair of Lions, a pair of Black Leopards, a pair of Chimpanzees, a Python and of course loads of endangered American Crocodile. The village is open to the public from 9 am to 4 pm daily. Here visitors will be entertained and thrilled as Buddy, the farms Crocodile handler, feed and interact with them. Asides exploring the village, visitors can also do some shopping for souvenirs and other items at the Kanaga House Gift Shop as well as enjoy freshly prepared food at the Safari Jerk. Visitors can also quench their thirst at the Village Bar where you can buy various kinds of drinks. A tour to this incredible attraction is a must for those looking to enjoy a truly wonderful vacation experience. Remember to come along with your camera so you can take great pictures while carrying a baby alligator and snakes. Swamp Safari Village has something to offer for everyone as there’s more than enough things to see and do. Want to Visit and Stay looking for accommodation? We have accommodation available for minimum four night stays at our OceanView vacation rental. Contact us for information on our fantastic last minute deals! Feel free to share this article on your social media platforms. Just press the buttons below.